TV drama Hua Xu Yin <華胥引>, which is adapted from the best-selling novel by Tang Qi Gong Zi (唐七公子), is currently filming at Hengdian World Studios. Although filming was originally expected to wrap up next month, with male lead Kevin Cheng (鄭嘉穎) putting in 16 hours a day to make the deadline, it was recently revealed that the drama is facing delays and may have to extend its filming schedule. In an interview with the magazine TV Series, Kevin shared that Hua Xu Yin still had at least 300 more scenes to film, and that he did not know when they would be able to finish. The drama’s production team acknowledged this setback, as well as the effort put in by the cast and crew, but was adamant about not rushing through the rest of filming. According to Zhao, Hua Xu Yin was produced according to movie standards from the start. With advanced filming equipment, an elite acting line-up, and costuming and artistic design team members who worked on Detective Dee: Mystery of the Phantom Flame <狄仁傑之通天帝國> and Legend of Zhen Huan <后宮甄嬛傳>, investments for the drama reached up to 140 million RMB. 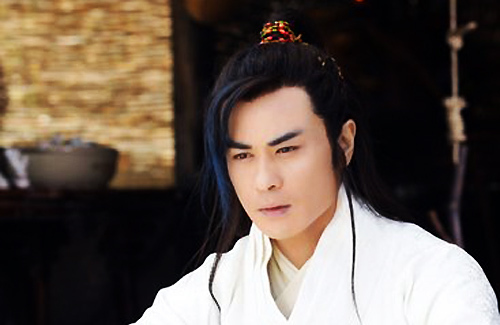 The drama’s executive producer, Fan Feifei (樊斐斐), also revealed that Hua Xu Yin is made up of four different stories, with each unit characterized by a distinct cultural setting. As a result, after each section, the set would have to be entirely reset, and everything from enormous palaces to trivial household products would be changed. This led to many of the delays in filming. Since the drama has a mix of fantasy and ancient Chinese elements, the costumes were an extremely time-consuming factor as well. Changing clothes and applying makeup took up a lot of time every day. Moreover, much care was taken to ensure that the costumes were not like the ones typically seen in ancient Chinese series. Designer Chen Minzheng (陳敏正), who was the chief designer for the 2008 Beijing Olympics, was invited to fashion each character’s wardrobe, and he ended up creating at least ten different outfits for each major character. Is it correct that Kevin was born and raised in San Francisco? Yes, he was and heard that he stayed here to study and all until his father passed way, so he came back to HK to be with his mom. No, HTS is partly wrong. He was born here but then raised in hong kong and studied there until senior high school. Most of his childhood time spent in hk, but then he came back here for 1 year studying and then went back to hk again for few years(he started joining the singing competition in hk but gave up eventually) and then went to canada for a year/ few years and then came back here for studying degree but didn’t finish his degree. All these are from his interview with stephen. As I’m from San Francisco myself, I don’t regard him as a SF person but a hongkonger person instead. He even regarded himself as a hongkonger in stephen’s interview. Not sure whether he still holds the us citizenship. After all, his career is in asia, and he won’t get a job if he comes back, so there is no point holding the us citizenship. And I heard he wanted to get singapore or china citizenship and buy a house and retire there (correct me if I’m wrong for this)? Ok, whatever… I don’t follow every aspect of his life. But the point is, his mom did not just come here to give birth to him just to get American citizenship just like many are doing right now. He did live and study here for a period of time which waas what I meant to say, but of course he is more of hong konger since he spent more time there than he did in SF. Oh…okay. Actually I already got your point in your first comment, but because it was only partly true, I just gave my own comment. There was no offense in my first comment as I just wanted to provide others with accurate information. And I don’t follow every aspect of his life either, but I can guarantee that what I posted was true because what I posted could be completely found in his interview with stephen, other than the last part of my comment regarding the singapore/ china citizenship. No other information was added by me; I just ‘copied and pasted’ what he said from the interview. I’ve also watched his interview with Stephen Chan and listened to his interview on RTHK before that. But, I still thought he was rise in US until his teens. I don’t remember him saying he was grew up in HK. But, wikipedia did say he moved back to HK in an early age. So, I don’t. I really have no recollection of it from his ‘Be My Guest’ interview. But he did really say that he was raised in hk in that interview. During that interview, stephen asked him whether he is american chinese, and he said yes but was grew up in hk so he is a hker too. It’s in the very beginning of the interview. Maybe he stayed in SF for a year/ few years when he was still a child, but for sure most of his childhood times were in hk. His upbringing was quite complicated actually as he stayed some time here and some time there and then went back to hk eventually. Before he was popular, I even though he was born in hk and entirely grew up there. Never realized that Hua Xu Yin would turn out to be such a mega project, judging from the cost of production and the meticulously designed costumes, etc. No wonder so much time has to be spent on it. I hope it turns out a winner. Once I saw him at a function from a far distance at a Chinese restaurant in Amsterdam a couple of years ago. He was already very popular with the fans. Some of them were even yelling his name. I can remember that Kevin was not that popular as now when he wasn’t acting yet. I am female by the way and am not a “he”. Oh, and there I was about to induct you into the [Jaynestars.com Gentlemen’s Club]. Oops, my mistake for not reading properly, sorry. And btw, you didn’t sound “offensive”, rest assured. Just got news that Hua Xu Yin wraps up today and that Kevin will be back in HK 2 days later.